This cookie has been my Facebook cover photo for a while. I look at it and think, ‘I need to make those again!’ Plus I’m still on this Oreo cookie kick, too! I’ve been buying quite a few packs of Oreos for the past month, and not a single one ended up in the cookie jar; they all went into a dessert for some special occasion…and into a lot of bellies. But the Oreos in these cookies did end up in the cookie jar, but in crumble form. They are absolutely delicious, and you can’t have just one! This is a recipe I changed up from the one my mom used. 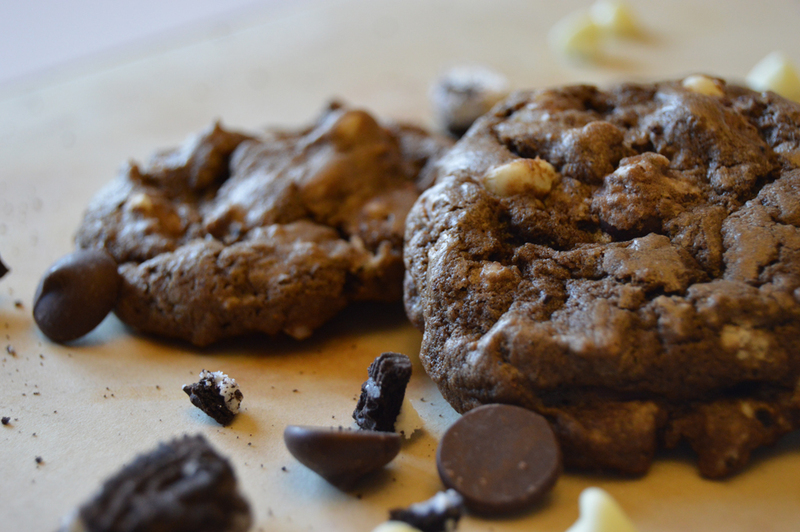 Mom’s recipe just had white chocolate chips and the cocoa powder, and they were made like reversed chocolate chip cookies; I just added in more stuff…lots of it…to liven it up! They only survived 2 days in my house. Yes, 2 days! My husband was raiding the cookie jar every couple of hours, and so was I! The tot loves them too, but I only give her about 5 broken cookie pieces as a dessert. No way am I going to give her a whole cookie overloaded with chocolate after 6:00pm! I want her (and me!!) to sleep!! It’s a lot of chocolate with a little bit of a crunch. But be warned, you’ll be going back to your cookie jar again and again, and you too will agree that you can’t have just one! Wow!!! It’s nice to see a lot of people liking my Facebook page!! I just want to say thank you from the bottom of my heart for your love and support. This encourages me greatly to keep this blog going and making it reach to new heights, and I do hope you all will come back again and again to see and try out what I’ve come up with! Don’t forget to follow me on Instagram and Pinterest, too! The links are to the right at the top of the page. Spread the word…and eat a cookie while you’re at it!! 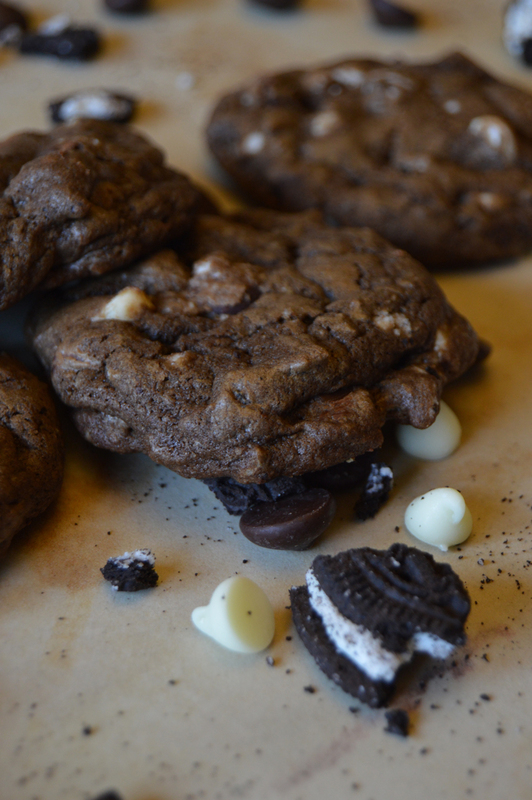 Crush the Oreos by using a food processor, or place them in a gallon-size zip-lock bag and crush with a rolling pin. Set the crushed cookies aside. Mix the margarine and sugars together in a stand mixer until smooth and creamy. Fold in the eggs, one at a time. Add the vanilla extract; mix well. For the dry ingredients, mix flour, cocoa powder, and baking soda together, then gradually add to the wet ingredients; mix well. 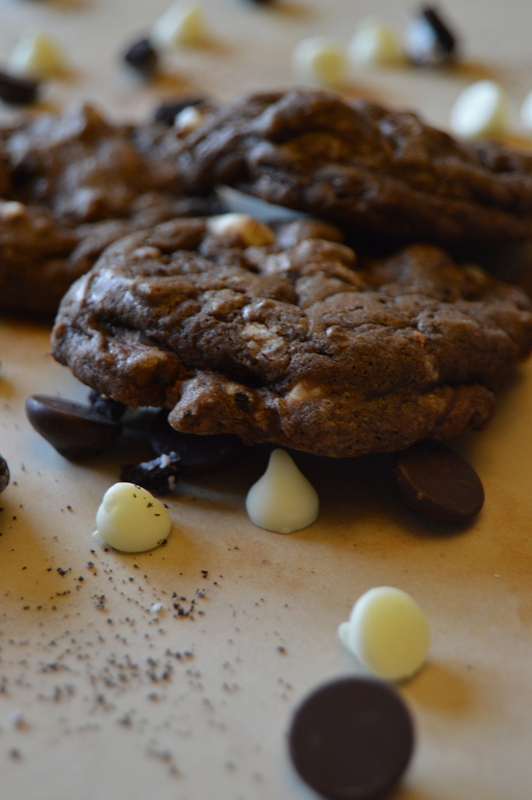 Fold in the white chocolate chips, dark chocolate chips, and the Oreos. Drop by teaspoonfuls using a spoon or a small cookie scoop. 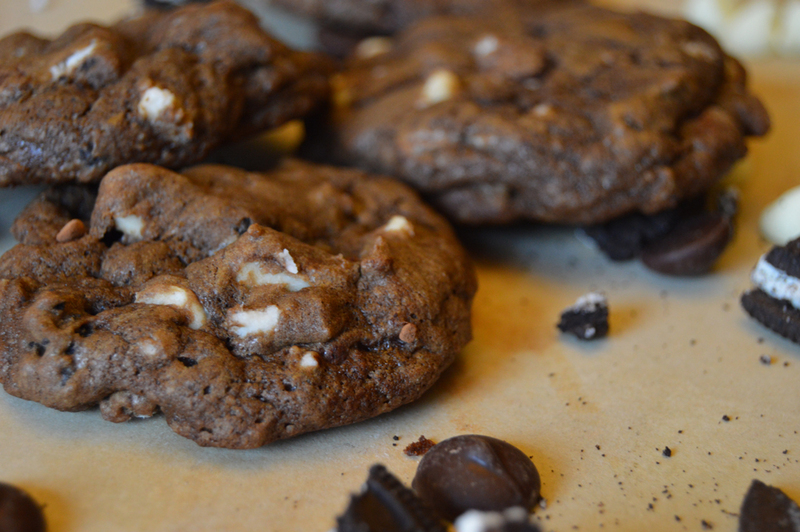 Bake for 10-12 minutes, depending on the size of your cookies. Makes about 3-4 dozen, depending on the size of your cookies.